These breathtaking photos show a whole new side to polar bears. 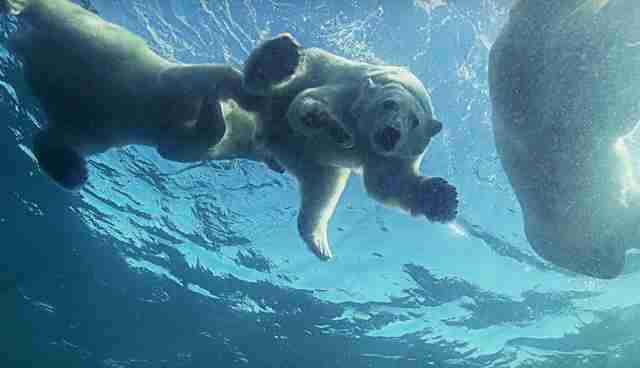 Wildlife photographer Amos Nachoum was finally able to complete his goal of capturing polar bears underwater, and the photos are out of this world. Nachoum told Barcroft TV he aimed to show the gentle side of polar bears, which could dispel the stereotype that they are terrifying or aggressive. Nachoum also wanted to show, through his photos, humans and wildlife are capable of coexisting without strife. "When humans use their intelligence ... we can interact peacefully with animals," he told The Dodo. "No wild animal wants to attack human beings, unless we cross their comfort zone." With an Inuit team for guidance and award-winning wildlife filmmaker Adam Ravetch as a partner, the results of Nachoum's grand undertaking are nothing short of stunning. He spent five days off the coasts of Canada swimming with the bears this past August. Nachoum spent 45 minutes with the polar bear family, slowly gaining their trust and understanding their movements before taking the big plunge with them into the water. He was able to capture the heartening moment when a mother bear taught her baby cubs how to swim as they searched for food together. 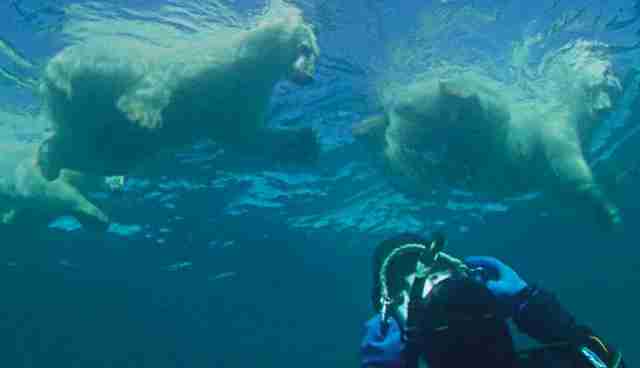 Nachoum and his team spent about three to four hours with the bears as they swam from island to island. 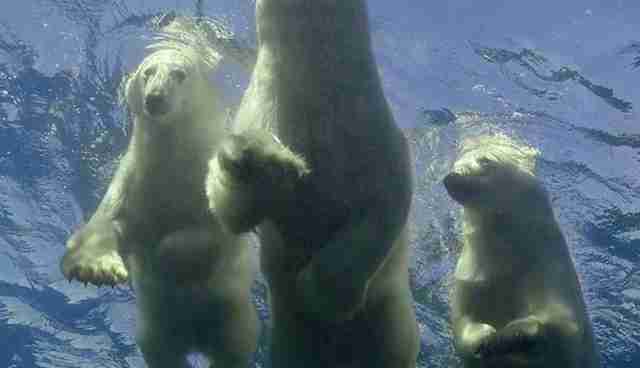 The polar bears mostly went about their business without paying much attention to Nachoum and his crew. Nachoum said the secret behind successfully photographing the bears was staying in the mother's line of vision at all times. "We weren't making any aggressive moves or moving toward her," Nachoum said. "She always knew where we were and that meant to her that she's safe, that we're not crossing the line. 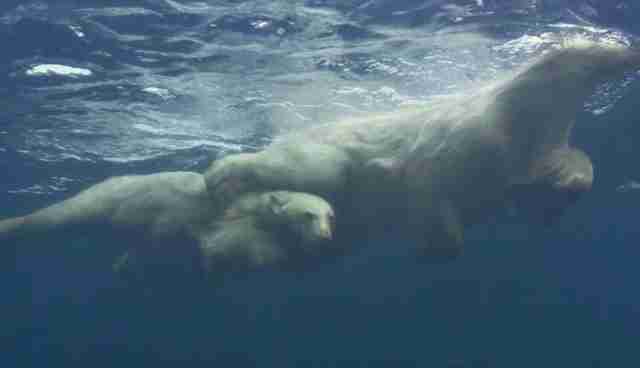 One of the babies actually went down to look at me, came close as three feet away, and then went back to the surface." 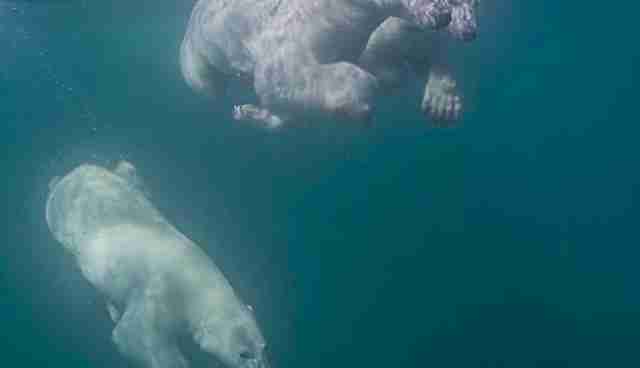 In Nachoum's world, polar bears are just your friendly neighborhood swimmers of the deep. 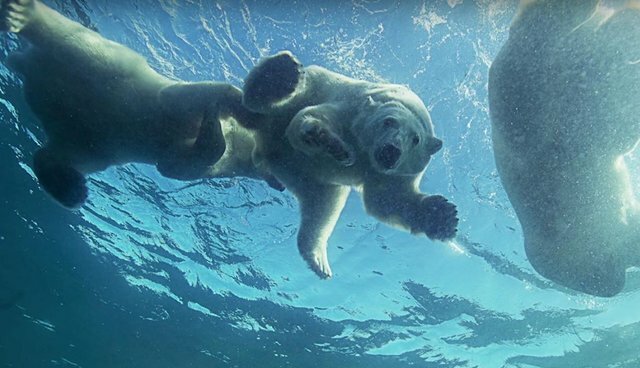 From the looks of these photos, these baby polar bears still have a long way to go before they perfect the art of swimming as gracefully as their mother. We're rooting for them! For more of Nachoum's work and information on upcoming expeditions, check out his website, BigAnimals.com.